It’s clear that Anna has been getting quite jealous of my kiting Nacra and in particular the fun we have breaking expensive bits of clobber. Of course, she is quite discrete and doesn’t make this feeling obvious – even some quite close to her haven’t noticed her suppressed desire to be doing something similar out on the water. Lucky I’m so perceptive! I’ve found a way to allow her to get involved. An opportunity arose to acquire a 15m proa that could be a great kite platform. I thought, what an excellent Christmas present! (You don’t want to know how many times kites for Moreton Bay Kiting have arrived in large parcels on Anna’s birthday!) The proa is the sort of thing that is a little difficult to keep discrete – so, I’ve had to tell her about it and remove the element of Christmas surprise. But my goodness, does she have some weird ideas for the work to get it on the water – her rudder design is truly bizarre. Negotiations to get the vessel have taken …. a while. It’s really not a big transaction. 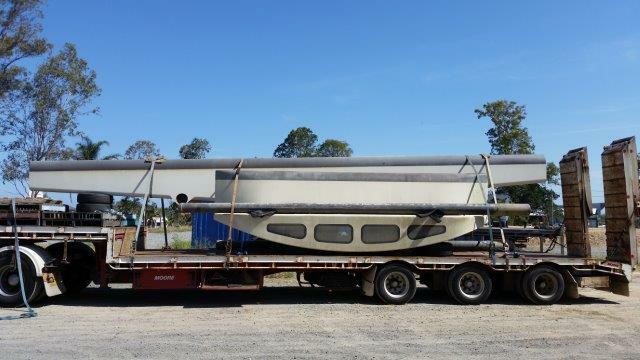 (Although the long hull is 15m long, it’s arguably much more like a beach cat than what you’d think of as a 15m sailing catamaran! Weight of hulls and beams: <400kg.) An offer was accepted, in principle, in mid-October. The appropriate paper work was not resolved until end November with delivery in early December. How can it be reasonable to take 7 weeks to get a 4 page document signed by 3 people and thereby allow about 3 weeks to get an enormous amount of real work (ie designing, grinding, glassing, wiring etc) done in order that it be ready for Christmas! And during this time most of my clients (for my real job) have been lawyers. Aaaarrrgggghhh! I REALLY need to go sailing (hope Anna will lend me her boat!). 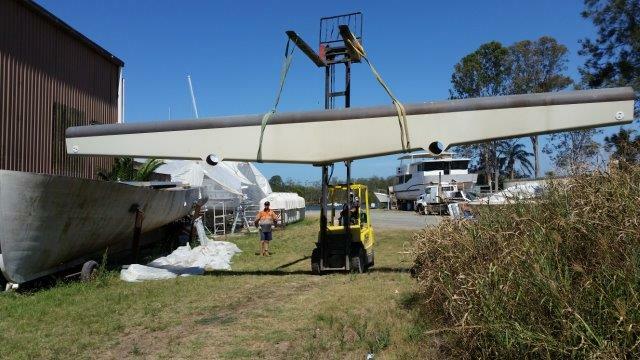 So, wish Anna luck in getting it ready for Christmas/NY period sailing! 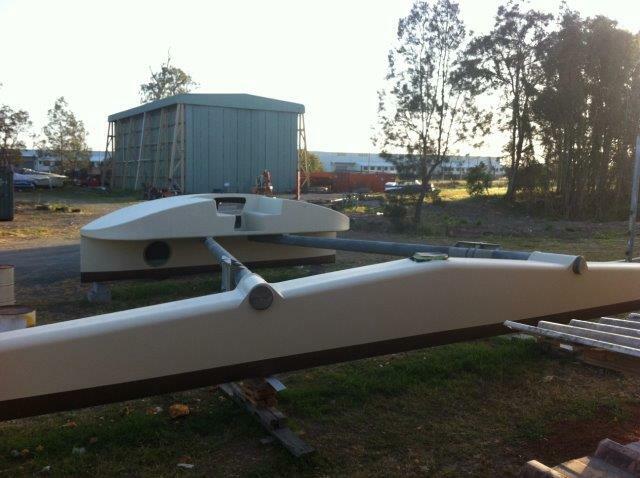 Meanwhile, what with having to juggle one or two other balls, progress on getting the Nacra flying again has been slow. But hopefully she will also be flying by Christmas…though that may depend on one or two other projects that are far less interesting than either the Nacra or the Proa!